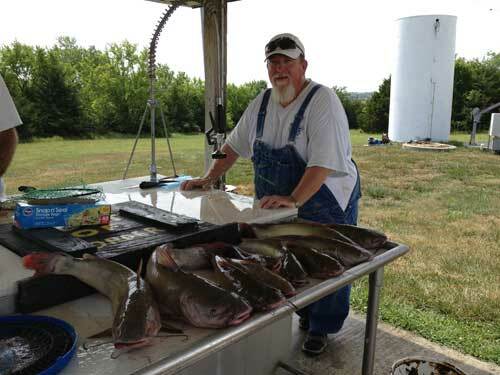 As someone who has fished quite a few Kansas lakes for bass, crappie, walleye and wiper, but never catfish, I took interest in recent stories of monster catfish being caught around the state. Motivated by dreams of reeling in a fish half my size, I decided it was time to try it out. After meeting in Holton at 5:00 a.m., CatDaddy and I drove to Banner Creek Reservoir, just outside of town. A smaller county-owned lake, the reservoir is home to some great bass, catfish and wiper. We drove CatDaddy&apos;s flat-bottom fishing boat out to one of his favorite spots on the lake and anchored down. Before dropping our hooks, CatDaddy threw out a few handfuls of chum, fermented soybeans. He refers to this as "giving the fish some love" because it whets a catfish&apos;s appetite. I like to think of it as an appetizer. Just as the sun was rising, I noticed my line slowly starting to move away from the boat. I yanked the fishing pole up and felt a hard tug back toward the bottom. After a fun little tussle, I had the hard-fighting 10-pound channel cat in the boat. For the next few hours, we never experienced much downtime, but managed to tell some great fishing stories between catching the daily limit. The following weekend, CatDaddy called to tell me about his great day fishing at the same spot on the lake. They&apos;d reeled in catfish weighing 22, 17, and 14 pounds in their haul that day, proving that a good day on the lake can be bested just a few days later. Having never used a fishing guide service, I wasn&apos;t quite sure what to expect other than to have some fun and catch lots of fish. CatDaddy definitely helped me achieve those goals, in addition to teaching me about catfish, Kansas lakes and a few tricks for river fishing. I also went home with a few tasty fillets. One thing I didn&apos;t expect, though, was to make a new friend in the process, an added bonus to fishing with a great guide. There are a number of fishing guides that specialize in a variety of fish located throughout the state. I&apos;d recommend Googling guides that specialize in what you want to catch or where you want to fish. Guides are perfect for beginners looking to learn how to fish or for more experienced fishers looking to learn new methods. You might just end up with a new fishing buddy.